It's hard to believe that I've known Julia for 14 years. Yes, back in the day when we were Umbro wearing, bad haircut having, chestless tweens, we really bonded over our shared awkwardness, gangly bodies and necessity for prescription deodorant. Let's be honest, not much has changed. But over the weekend, Jules entered her 26th year. Our little girl has grown up. And while she left behind her blunt bangs and Abercrombie baby tees, there is one thing that will never change. Julia loves chocolate chip cookies. I mean, really, she loves them as if they were her own child. They are, how shall I put this, her drug of choice. And while her favorite used to be Entenmann's fresh out of aisle three, it's safe to say she's probably never met a chocolate chip she didn't like. But then, my friends, she, or I, met the cookie of our dreams. Read on. This recipe is truly superb. One of those that when you're making the batter you know you've struck gold. One of those where waiting for the end product to cool is torture. I mean, try eating a cookie out of a cast iron skillet that's been at 375 degrees for 30 minutes. No thank you. The consistency was somewhere between a cookie, a blondie and the gates of heaven. And I think, no, I know... you will not be disappointed with it. 1. In large bowl, cream butter, granulated sugar, brown sugar, and vanilla until light and fluffy. Add eggs, one at a time, beating well. 2. In a separate bowl, combine dry ingredients (flour, salt and baking soda). Gradually add the dry ingredients into the wet. Beat until just combined. Stir in chocolate chunks by hand, making sure they are incorporated fully. 3. Spread in greased 12-14 inch round cast iron skillet. Bake at 375 degrees for about 35 minutes (times may vary). I think it's better to take it out a little early because it will continue to cook in the skillet. 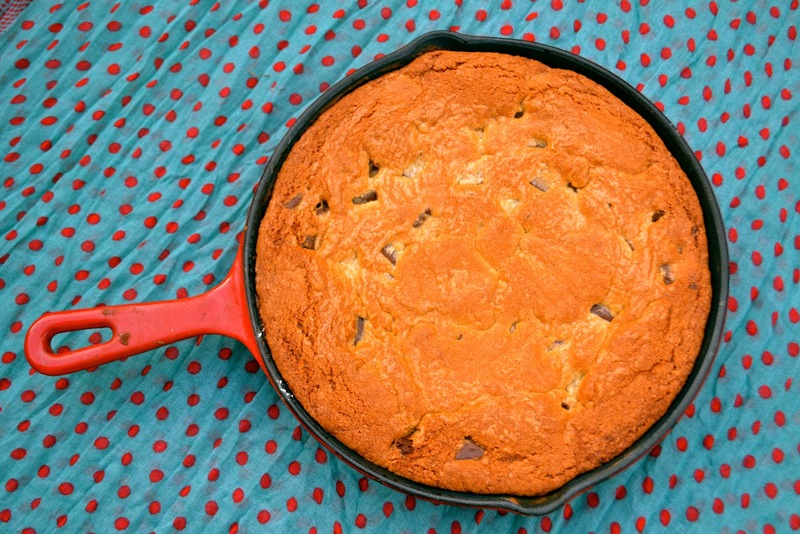 Cool cookie in pan on a cooling rack, or just dig right in. You may burn your tongue but you'll warm your soul.